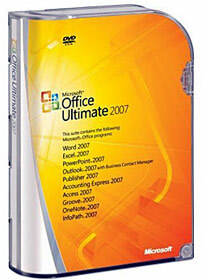 The downloadable Office Ultimate 2007 includes Word, Excel, PowerPoint, Outlook, Access, Publisher, OneNote, Groove, and InfoPath! Although you probably won’t use half them, I still strongly recommend taking this offer. Interestingly the same offer was run in 2007 and only 15,000 people found out about it and bought the software. That’s a shame because $75 for a permanent licence to the best edition of Office 2007 is a real bargain. Otherwise even an OEM cut down boxed student version costs upwards of $150, if not much more. I live in Australia myself, Brisbane to be exact. And I am planning on undertaking a Computer Sciences course and this might come in handy. I wouldn’t mind a cheap copy of Microsoft office, even though I already have a downloaded copy. There’s just something so satisfying owning your own copy of legit software, wouldn’t you agree? I forwarded this to a few friends – pity I can’t use it . Maybe next year I will get my son enrolled in TAFE. Also, if student’s purchasing the software have their own blog they can enter the golden blog competition. All you have to do is basically promote the offer and enter a few key words, which I have done on my blog with this post http://whatsonthetube.net/2008/02/06/lets-see-if-i-can-win-something-for-once/. However some people have been really creative in their post eg writing a poem etc… So it is worth giving it a go. EDITOR: thanks Danny, I forgot about that comp. Good luck. Isn’t open office better? And it’s…open source! EDITOR: I’ve tried Open Office and while it’s OK It’s not the same as MS Office. I just can’t get used to the new menus in 2007. For now I’m recommending to most of my clients to use free versions like Open Office, and increasingly have been happy with Google Docs. I’ve got even better price – FREE. OpenOffice is a very good alrernative. Is is licensed for only 1 user or up to 3? Is this a legit copy of Microsoft Office? $75 for the Ultimate is too good to be true (sounds very fishy to me). If any of you could advice, much appreciated. Thanks. I tried to go to the website, but when am trying to make the payment, the website re-directed to non ‘microsoft’ webpage. Just want to double check that this is not a scam or something else. If you could advise, much appreciated. One question is whether or not its OEM? The reason I ask is that I’ll be upgrading my home system very shortly and I wanted to install to my current and then migrate it to my new computer once I get it while also using it on my laptop. I am about to purchase Office Student as it is normally the cheapest version.I have Open Office but the college I attend uses Word for workbooks and submissions on line.So when I tried to enable the macro in Open Office it could not work with the college’s.So here I am thinking I will be fine with Open Office but no I still have to buy Microsoft.Bummer …. So yes u are very right about your response to jix2mail..